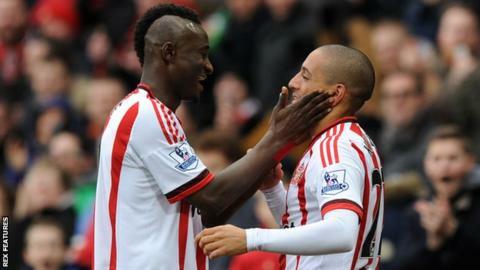 Manager Sam Allardyce has credited Sunderland's January signings for their 2-1 win over Manchester United. The Black Cats spent about £20 million during the transfer window bringing in five new players, including midfielder Wahbi Khazri, who scored their third-minute opener against the Red Devils. "The new players have made this victory," Allardyce told BBC Newcastle. "Wahbi [Khazri] scored one and made one. Lamine [Kone] scored the winner, and the team could have scored more." Four of Allardyce's new signings made the starting line-up in the victory - and defender John O'Shea believes their presence can only boost their survival chances. "I think the impact the new boys have had for us will hopefully increase that competition within the squad," he said. "I've always said throughout my career that if you have increased competition you're going to get increased performances and ultimately better results." Sunderland's win continued a recent run of form which has seen them earn 11 points in seven games and leaves them within one point of Newcastle and safety with 12 games remaining. The Black Cats will next face West Ham away on Saturday, 27 February.